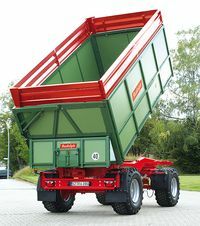 Market leading quality "made in Salzgitter"
Our hugely varied vehicle range meets any requirement: Starting from the DK 280 RP and the „Allrounder“ DK 280 RA, via the legendary DK 280 W, the DK 280 R/RL, the tandem axle type TDK 300, you arrive at the combinations among tandem- und portal dumper TDK 300 RP. We are sure to provide the ideal solution for any task. Our R & D philosophy focuses on continuous progress, which means that we will always adapt available new technologies to provide you with even more economical, user friendly vehicles and equipment options. Highest expectations define our standard. Best Quality "made in Salzgitter". For more than 90 years, agricultural vehicles made by Rudolph & Sohn are benchmarks of innovative technology, field efficiency and durable top quality "made in Salzgitter". All our products are made from top rated materials and are built exclusively in our own assembly plant at Salzgitter-Heerte. This allows us to guarantee top brand quality and a long lasting supply of spare parts. Rudolph trailers are known for their stability and reliability for decades. With the DK and TDK series, we are not only continuing this tradition, but are also ensuring great utility and high value retention of the vehicles through future-oriented details. All in all, the high standard of equipment, the practical detail construction and the favorable pricing make our dumpers an investment that pays off.